Salty, sweet, and crunchy. What better combination could one hope for? My aunt made a similar recipe years ago and gave tins filled with this mouth-watering mixture as holiday gifts. I noticed that my husband was eating more than his fair share of our tin, and I asked him to stop! So delicious was this snack, I actually got a little territorial about my portion! I hadn’t made this in quite a while and, with a birthday approaching, my son and I were discussing options for his birthday snack at school. He likes to share something he thinks is a little out of the ordinary. Last year, he requested two varieties of Oreo Bark. He loves popcorn so I made a sample batch of this. It didn’t last long! I have adjusted my aunt’s original recipe, including a switch from corn syrup to honey. If you do not have honey on hand, you could certainly use an equal amount of corn syrup. I also include several of my tips to make the preparation of this snack easy and foolproof, including the use of a bigger-than-necessary pot to make the caramel mixture. That way, you can mix the popcorn in it and save one more messy bowl! In a large pot (large enough to add the popcorn later and toss), melt the butter over medium heat. Stir in the brown sugar, honey, and salt. Bring to a boil, stirring constantly. Once the mixture comes to a boil, boil for 4 minutes WITHOUT stirring. I adjust the heat to the lowest possible temperate that will just maintain a boil. This way, the mixture won’t burn. After 4 minutes, remove the pot from the heat and stir in the vanilla and the baking soda. The mixture will get bubbly; this is normal. Immediately add the popcorn and peanuts. Toss gently but thoroughly. 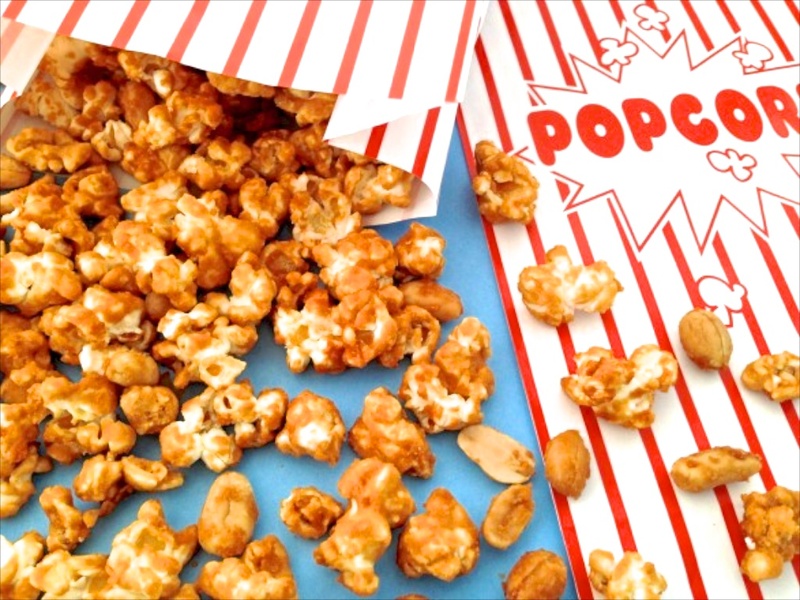 If the mixture starts to firm up before you have thoroughly incorporated the popcorn, place the pot over low heat to soften the caramel mixture and finish mixing. Place the popcorn mixture in a greased, 9×13 baking dish or other large, shallow pan and bake for 45 minutes, stirring every 15 minutes. Remove from the oven and turn out onto parchment or wax paper and cool thoroughly, breaking apart any large clumps, if desired. If you double the recipe, you may want to bake 15 extra minutes for a total of one hour, stirring every 15 minutes. When finished, fill the sticky pans with hot water and allow to sit for a few minutes. All the excess caramel mixture will dissolve and cleanup will be a breeze. Made this as a gift this year for Christmas! I’m sad I gave it all away. I will be making a batch for us shortly.